Three years after Világ was all but laid waste by the Killorans, the Doctor is back alongside a different companion. And a lot has changed. Now elected Principle Triumvir, head of a tripartite government, Rossiter is working to secure a peaceful future for the planet by researching the technology the Killorans left behind. But he has to contend with opposition from his daughter, Sofia, who heads a public campaign demanding the destruction of all alien artefacts. Politics has caused a rift between father and daughter, and as if that weren’t enough, Sofia doesn’t approve of her new step-mother either. Emotions soon boil over into violence, a violence that seems to have gripped the entire city. School Reunion is a standout episode for me, and not just because of Anthony Stewart Head playing a fantastic villain. It’s the return of the iconic companion Sarah Jane Smith (and therefore, Elisabeth Sladen) to the show after nearly thirty years. This particular moment early in the episode is one of my favorite Who moments of all time. Before School Reunion, once a companion departed the TARDIS, that was usually the last the viewers saw of their characters. There were a few exceptions, such as Harry Sullivan’s one-off appearance in The Android Invasion, but in most cases once a companion left, they were gone for good. School Reunion showed viewers for the first time how a companion’s travels with the Doctor affect their lives AFTER they leave the TARDIS, as Sarah Jane admits to the Doctor how she thought he had died after not seeing him for nearly thirty years, but how their travels together shaped her into the fiery and investigative woman she had become. It’s a unique insight into the nature of a companion’s post-TARDIS life…and a topic Big Finish touched upon as well just one year before. Thicker Than Water isn’t about the overall plot, a simple one involving alien technology and genetic experimentation. It’s also not a story about the supporting characters, where some was paper-thin cutouts, some standout, and once again Mel has her moments, both good and bad. 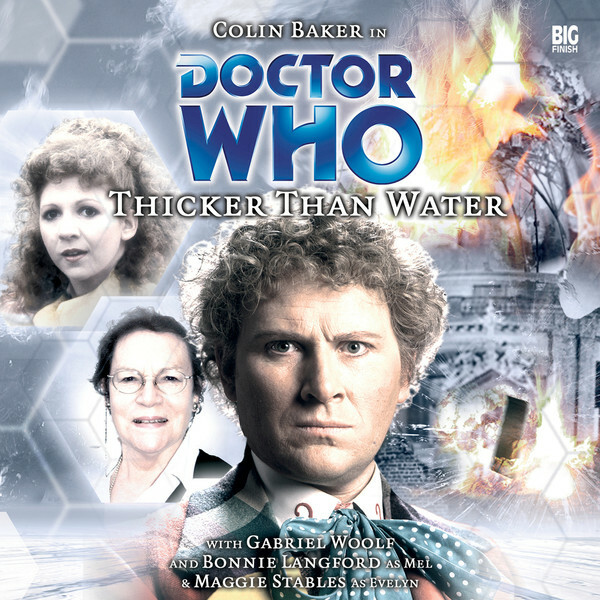 What Thicker Than Water IS about is the relationship between Evelyn and the Doctor, set a few years after Evelyn has departed the TARDIS for a new life on a new planet. And in that regard, it succeeds in spectacular fashion. For Paul Sutton’s second Big Finish story, a direct sequel to Arrangements for War, Sutton focuses much more on the character interactions than on the bare bones plot. There is talk about alien technology, genetic manipulation, and Vilag’s recovery from the Killoran invasion, but those aspects are given lip service at best to drive for the villain’s “the ends justify the means” mentality. Sutton’s script does sprinkle some fine character moments throughout the story, such as a backstory between Sofia and Sebastian that explains some of their actions. While Sutton is showing that he can play with the chords of emotions better than most Big Finish writers, where Arrangements for War was a series of events that happened because the story needed to move along, Thicker Than Water suffers from a wraparound plot that’s there solely to place the characters in harm’s way. I say this because while the individual pieces of the story are interesting, the way they weave together to the villain’s revelation is incredibly shoddy. The villain of the story is obvious from a mile away, even with a red herring or two tossed about, and the isn’t any sort of payoff regarding the medical experimentation that are inflicted upon the Killoran prisoners. While it’s fine for a story to put character over plot, the plot itself still has to carry the action, and in this story, the plot trips and falls on its face during the story’s climax…which concludes with over ten minutes left in the story! This is the first story I’ve listened featuring Maggie Stables in 2014. It definitely affected the way I listened to this audio, as I was prepared to start getting a bit emotional at the first sound of her voice. But when her public debate with Sofia Rossiter quickly turned toward anger and frustration, with Evelyn throwing her microphone down and walking offstage, I was shocked. THIS wasn’t the Evelyn Smythe I knew! What the heck had HAPPENED during the two years since her and the Doctor had parted ways? Sutton jumps back and forth over those two years throughout the story, filling in the gaps of what happened between Evelyn, her new husband Rossiter, and how she adapted to her new home. While the driving force behind Thicker Than Water is the story between Evelyn and the Doctor, they barely spend any of the runtime with each other. While Colin Baker and Maggie Stables have great chemistry and I wished they had more interaction, listeners are allowed to see just how Evelyn is affected by the lack of the Doctor’s presence in her life. In the new series, the Doctor just drops in and out of his companions lives all the time, Eleven and Twelve taking this to an art form with the Ponds and Clara. But here, the Doctor has left, and Evelyn doesn’t quite know what to make of it. She makes a life for herself, of course, but she wishes she could come to terms with the Doctor himself about how things ended between them. When Maggie is on, during her time alone side Mel and during her flashbacks, the retired teacher-turned-actress is ON. Determination, anger, fire, weariness…it’s all in her performance. What makes Stables’ performance so wonderful in the part is that when other characters talk about her, they talk about her merits AND her flaws. Evelyn isn’t perfect, but she is a full-blown character which Stables fleshes out, wishing to see the Doctor again even as she’s moving on with her life (an idea listeners will get to see the other side of in the upcoming Five/Tegan story The Gathering…). Sometimes, the Doctor gives in to his impulses. Even if he can’t quite come to terms with seeing Evelyn again, as soon as she’s kidnapped, he leaps into action to save her. Colin Baker’s character development for the Sixth Doctor, with Big Finish at his side, has been remarkable, and having Evelyn Smythe as a companion contributed immensely to the rehabilitation of the Sixth Doctor’s reputation. The Sixth Doctor isn’t perfect – he still suffers a bit in the area of social graces when introducing Mel to Evelyn, and he’s not quite blessed with tact as he directly accuses characters (with the proper logic) of being involved in Evelyn’s kidnapping. Baker gives the proceedings a sense of desperation, the Doctor putting on a brave front as he tries to find where Evelyn has been taken to, going to far as to donate his very own blood to save her life as she lies on the operating table during the story’s climax. The supporting cast is solid, but could have been a bit better. Gabriel Woolf (of Sutekh and the Creature in the Satan Pit fame) returns as Principal Triumvir Rossiter, and the chemistry between him and Maggie Stables sells their October-romance. There’s a new fire in his eyes with having to help rebuild his home planet, and when he finds out somehow has kidnapped Evelyn, hell hath no fury. Woolf shows us the kind of man Rossiter is, a man for whom Evelyn would leave everything on Earth, and in the TARDIS, behind to start a new life, which is a critical relationship that helps make this story work. Patrick Rommer, best known for his recurring role on the BBC drama Casualty, plays the obvious villain Szabo, and by obvious, it’s apparent from the moment there IS a villain in the piece just who it is. He’s smooth and charming, but doesn’t quite hit those tones in the way a villain should. Rachel Pickup’s Sofia Rossiter could best be described as “wicked stepdaughter,” as her anger towards Evelyn is barely tempered by the story’s events, even with the death of her misguided friend Sebastian, played by Simon Watts, who does well in his small role as the person who does what he thinks is best for the person he thinks is best, but ends up in way over his head. Matt Dimeen plays bodyguard Jenner, and he finds the right balance between “by the book jerk” and “human feelings lead to bodyguard failings,” come off as incredibly competent, a bit dry in terms of humor, and playing the part of the cavalry with aplomb. I have to give props to the production crew for this story, as they take two of Sutton’s plot points and turn it into something chilling; a group of Vilag citizens who have been experimented upon to the point of insanity, with their screams and rage as they try to break into the Doctor’s hiding place, and a group of Killoran prisoners who have had their very DNA twisted to the point that their minds are broken. So broken, their gibberish can’t be properly translated by the TARDIS! These two groups and the way they’re presented on audio show how Big Finish has transcended the “three people muttering equals a crowd” cliché that marked some of their earlier productions. The heart of Thicker Than Water is all about the relationship between the Doctor and Evelyn. To me, THIS is how Rose and Ten’s friendship should have been handled. I was prepared to not like Rose after finding out that a former pop star was playing her, but Billie Piper won me over as Rose turned out to be a pretty awesome companion. But when she left the Doctor, Ten spent so much time pining for her that it drove Martha away. He ended up sending a clone of himself to be with Rose in another universe. One could say that the Time War changed the Doctor’s priorities vis-a-vis his companions, but it just was so out of place and over the top…especially considering how Donna’s time in the TARDIS ended. When Evelyn and the Doctor say “goodbye” for the first time, it’s not goodbye but a quasi-breakup. After Jubilee, …and the Pirates, and Project: Lazarus, the events of Arrangements for War are the last that Evelyn can take. The Doctor knows what’s coming…but this is not only the Doctor, but the Sixth Doctor. There’s talk of “see you again” and what not, but deep down inside the Doctor knew he made a botch of the whole situation. So, he jumps at Mel’s suggestion to see her again. And there’s no jealousy on Mel’s part. It’s a straight forward “you had old companions, you talk about them, I’d like to meet the one you talk about a lot.” It perfectly fits Mel’s character. Mel and Evelyn get along great during their time together, Evelyn joking that Mel was the “latest model” and Mel just laughing it off. There wasn’t a hint of underlying jealousy like that kind of, sort of was with Rose and Sarah Jane during their still-damn-amazing on-screen time during School Reunion. At the end of the story, the Doctor and Evelyn hash everything out, but it’s not a big drawn out melodramatic moment. It’s quiet and poignant, as the Doctor is there for an important moment in Evelyn’s life, as she hoped. There’s no pining, there’s no holes-in-hearts to be filled. It’s what happens when someone truly and deeply misses a friend, a friend who was there in your life at JUST the right time when they were needed most, and Evelyn was just the friend the Doctor needed, after the Trial of a Time Lord and losing Peri. Friends move on, friendships fade away…but THOSE friends, the ones you can drop in on five, ten years down the line and pick up right where you left off, or the friend you could dial up at 3 in the morning and, because it’s your name on the phone, they’re going to pick up…and for Six and Evelyn, I got the sense of quiet delight as a teacher sees a favorite students after all those years and knows the impact they had upon their life. Now, there’s one other thing to mention…and that’s the big “twist,” as the Seventh Doctor drops in Evelyn where she’s recovering from her surgery. Sylvester McCoy’s appearance caught me completely off guard, much like his cameo at the end of The Wormery, but it ties into the story very nicely. The Seventh Doctor gives Evelyn a piece of good news – that his newest companion, Hex, is actually Thomas Scofield, aka “little Tommy,” aka Cassie’s son. It’s a great little scene that underlines just how much of an effect Evelyn had on the Doctor’s life and how Seven isn’t afraid to bend the laws of Time to make sure everything works out and Evelyn understands that life goes on, with the Doctor, as always, trying to do his best. It’s a very lovely moment…but a little more explanation would have been nice, as there might not only have been listeners who had no idea who Hex/little Tommy was (and if you’re one of them, for God’s sake go pick up The Harvest from Big Finish), or might not have remembered who Cassie was, as it had been over two years since the release of Project: Lazarus. Synopsis – Thicker Than Water sees how Evelyn Smythe deals with her departure from the Doctor’s side in a story where character interactions trump the throwaway plot and listeners realize just how much Maggie Stables will be missed. 4/5. Sylvester McCoy is the Doctor in…LIVE 34. This entry was posted in Big Finish Review and tagged 4/5, Big Finish, Big Finish Audio, Big Finish Review, Bonnie Langford, Colin Baker, Doctor Who, Doctor Who Audio, Doctor Who Review, Evelyn Smythe, Maggie Stables, Mel, Sixth Doctor, TARDIS. Bookmark the permalink.